One of the most stimulating fermented foods is kimchi. Its tangy, garlicky, soul stimulating, palate titillating hotness quickens the pulse, and can even bring tears to the most stoic. Until now, I haven’t really been able to created a recipe that lived up to what I tasted in Korea when I visited some years ago. I have hunted around for a good recipe, but all the more authentic ones required the making of a kimchi paste composed of way too many ingredients, and required too much of my time. However, when my friend Lisa Murphy of Sosu Sauces gave me a sneak-preview bottle of her Barrel-Aged Sriracha (lucky me! ), my quest for an easy, AND super tasty kimchi ended. So, for those of you who backed Lisa’s Kickstarter campaign, you too can look forward to making your very own killer kimchi! 1) Place the chopped cabbage and onion(recipe #1) OR daikon (recipe #2) in a large bowl. Add in the sea salt and massage the veggies with clean hands by giving them gentle squeezes for about one minute. Set aside for 30 minutes. 2) Next, add in the rest of the ingredients and mix well. 3) Pack everything, including the liquid that has leached out from the cabbage, into a quart-size, wide-mouth mason jar. 4) Using a mortar, or wooden spoon, pound down the mixture to help release more liquid. Be firm here and really pack down the cabbage mixture until it is about 2” below the shoulder of the jar. 5) Find something such as a small glass jar that will fit through the opening of the mason jar to act as a weight on top of the cabbage mixture. 6) There should be enough liquid to exceed the top of the cabbage mixture by at least 1”. When ready, keep in the fridge. Many recipes for fermented vegetables call for placing a cap or lid on tightly, BUT this is a mistake. Please read on to find out why. ( lactic-acid producing bacteria) which acts to bring down the overall pH, thus crowding out the bad bacteria (that will cause spoilage). LABs create an acidic ambiance that favors good bugs, such as lactobacilli, a type of probiotic that is needed for a healthy gut. The best “system” is one that keeps the vegetables under the brine, along with an air-tight device which allows the carbon dioxide to be released, while keeping air-borne microbes and bugs out. That’s why my recipe calls for weighing down the cabbage mixture and then placing a cloth over it. Admittedly, this is not the greatest option, as it may be difficult to find a small jar that fits into the larger mason jar. Another way is to fill a zip-lock bag with water and place it over the opening, but plastic can release toxins when in contact with acid, such as the brine that the vegetables are fermenting in. 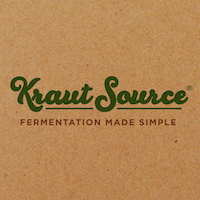 For the best and easiest way to make kimchi or any lacto-fermented vegetables in mason jars, without having to fuss with finding a weight that just fits inside the jar, Kraut Source is your answer! Coming to Kickstarter in June, 2014!